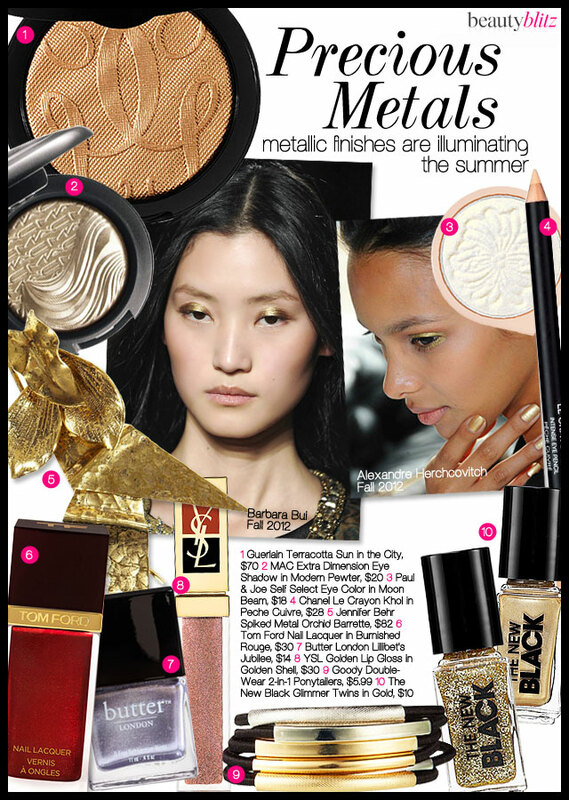 When summer hits, we all want a little glow, and this season it's all about a metallic finish. Wear it on your lids, lips and tips, plus hard metal makes the for the perfect hair accessory. This creamy powder is made with gold mother-of-pearl to give it that luminous finish. It can be dusted on your face or body to give you a radiant touch of bronze. $70 at nordstrom.com. Get metallic lids with this liquid-powder shadow. It can be applied for a sheer wash of color or built up for more intensity, plus the chromatic color lasts up to six hours. $20 at maccosmetics.com. Already have a favorite eye shadow or liner? This pan of sheer gold will turn any shade into a warm metallic finish when layered on top. So clever! $18 at paul-joe-beaute.com. Brighten your eyes with this golden shade of peach. Line your whole lid, or strategically place it in the inner corners for an enlightening effect. $28 at chanel.com. This graphic barrette has nothing in common with the ones of your childhood. Each one is handmade from vintage metal earrings and makes a major statement. $82 at jenniferbehr.com. There's nothing typical about this red polish. From the mirror pearl particles to the rich shade, your nails will look like they're dressed in liquid metal. $30 at neimanmarcus.com. We're celebrating Queen Elizabeth's Diamond Jubilee with this silver polish infused with a hint of lavender. $14 at butterlondon.com. Even lips are getting the metal treatment. This soft pink gloss has plenty of shine and light reflecting particles for a metallic sheen. $30 at nordstrom.com. These hair bands double as a bracelet and a pony holder. $5.99 at drugstore.com. This two-piece set gives you a metallic gold polish and a coordinating glitter polish perfect for creating all sorts of sparkling nail designs. $10 at sephora.com.